This entry was posted in Buildings, musings, Travel and tagged ruins. Bookmark the permalink. The number of individual farmers has shrunk greatly these past years. It seems that only large concerns can still make a go of it in these times of global competition. Small scale farming is probably just not competitive enough to be able to withstand pressures for lower production prices as exerted by the likes of retailers like PnPay and Checkers and food conglomerates like Tiger, Pioneer, Tongaat, etc. You are spot on with today’s farming issues. 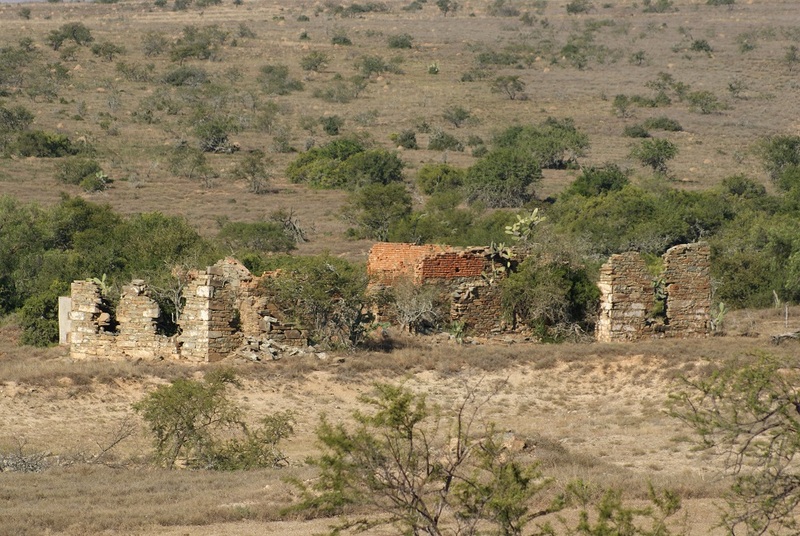 This particular dwelling is in the Eastern Cape, and is reminiscent of many farm that were carved out in the virgin bush by Dutch- and English-speaking people moving here for a variety of historical reasons. Some of these original farms have been amalgamated with others, making the dwellings superfluous, while others seem to be a lasting testimony to barriers that became too much. They stir so many thoughts in me too … I felt the need to photograph this particular one for it has been noticeably crumbling more rapidly in recent years; then its story will be lost forever. We too see empty farmhouses in the countryside and wonder who their occupants were and why they left. They are such melancholy places. Love the writing style and melancholy story and photo. I love old ruins and I can sit for hours wondering what went on between those walls.